This time we will do a Weaving cast-on, the method of tension swatch you prefer, and Back Stitch Bind Off from L TO R.
Pull the number of stitches required for your swatch all the way out(Hold position). Now push every other needle back to working position. 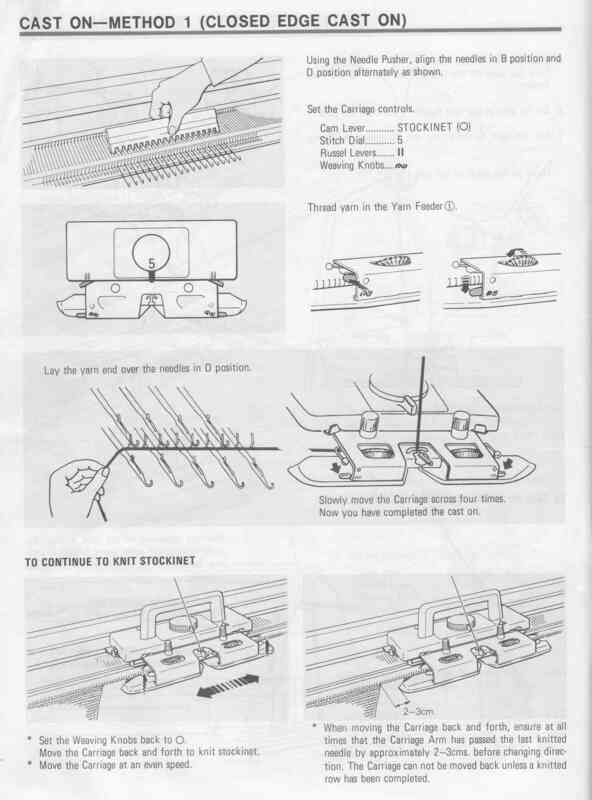 Place the weaving brushes on the carriage (in the presser plate...see your manual for details) into working position. Now, with the yarn threaded into the carriage, take the tail of the yarn, lay it over the needles (in front of the gate pegs), and now run the carriage over these needles. The needles will knit every other needle and the yarn tail will be woven it. Knit with the weaving brushes engaged for approx 6 rows, and then go ahead and disengage the brushes and knit as usual. Claw weights on the edges usually are sufficient. If you wish to use the cast on comb(Brother) go ahead and do so, or like Studio Knitters do, use the method (In Lesson #1) of pulling the needles out to hold before knitting for the first approz 6 rows until you have enough space to comfortably hang your claw weights. It is a closed edge cast-on and is often useful for rehanging a hem easily, or the yarn tail can also be used to draw up an edge, such as on the top of a ski hat or something. Try it, you'll like and use it often. Continue with the tension swatch. 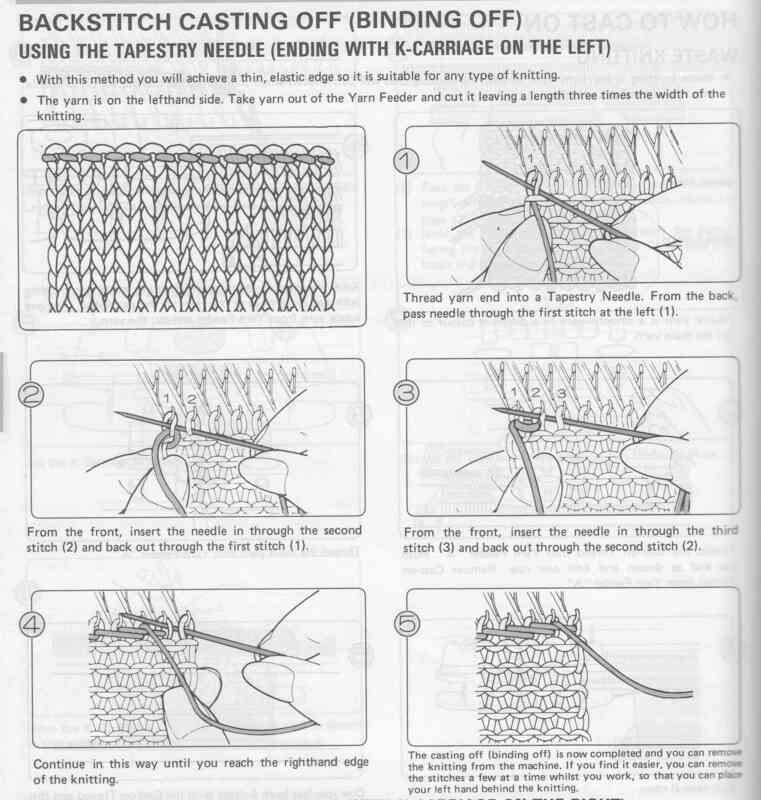 After the 2 contrast rows, with MC thread your carriage and program your machine for SLIP according to the manual and knit your slip swatch.Please check your manual for all the setting required for your machine to knit slip. Knit your swatch. Remember to mark your needles as you desire and do 2 rows of CC between your rows of your swatch and the waste yarn. I think the instructions in the Brother KH270 as well as the Brother KH9340/940 manual show it as well as possible, so I have included those instructions right here. This is the same method as we will be doing in Lesson 4, but we will do it from the opposite side in Lesson #4.